BLOG TOUR + ESSENTIAL READING | Books the Characters in Brutal Youth Would Love + Why! 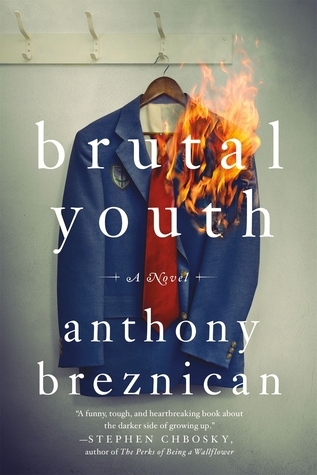 I have a special Essential Reading post, courtesy of the Brutal Youth blog tour, and I couldn’t be more excited to welcome Anthony Breznican to my blog! I love reading about the books that Anthony picked for five of his characters and reading how those books inspire those characters like Noah writing a paper on Mr. T or Hannah tattooing a certain quote on her arm. Let’s see what Anthony picked, shall we? I love this question! It’s one I would never have thought of on my own, but it gave me a chance to revisit the kids from Brutal Youth and imagine which books might strike a nerve with them. Since the story is set in 1991 and 1992, I restricted myself to books that would actually have been available to them at the time, although there are many more recent ones these characters would love. I should start by setting up the story: Brutal Youth is about a group of newcomers at a corrupt, crumbling private school outside Pittsburgh, where hazing is sanctioned as an hallowed tradition, and people will do anything to avoid the grim fate that awaits anyone at the bottom of the food chain. Brutal Youth promises you exactly what the title says—a brutal youth. From the aggressive bullying of the freshmen by the upperclassmen to the lack of concern from the teachers, it’s everything you don’t want to experience in a high school. For these kids, it’s become a norm—surviving this bullying culture that can make any kid and adult a monster.